We’ve been busy here at Process Bliss HQ making it easier than ever for you to login, get started and improve your processes. Here’s a summary of the new features and improvements we’ve implemented in November. Our new in-platform feature, Tooltips, provides you with all the help you need to get started. It guides you through building your first process, making sure you don’t miss the important things like assigning steps to other people and making steps optional or essential for the completion of the process. 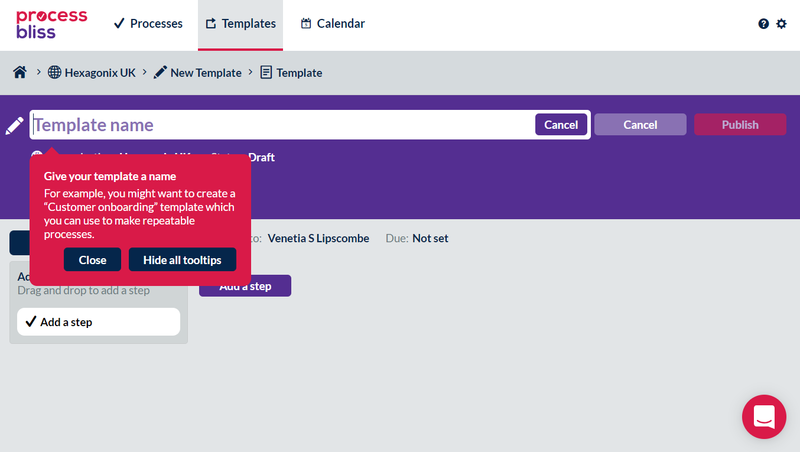 Once you’ve created your first process, Tooltips prompts you to save it as a template. 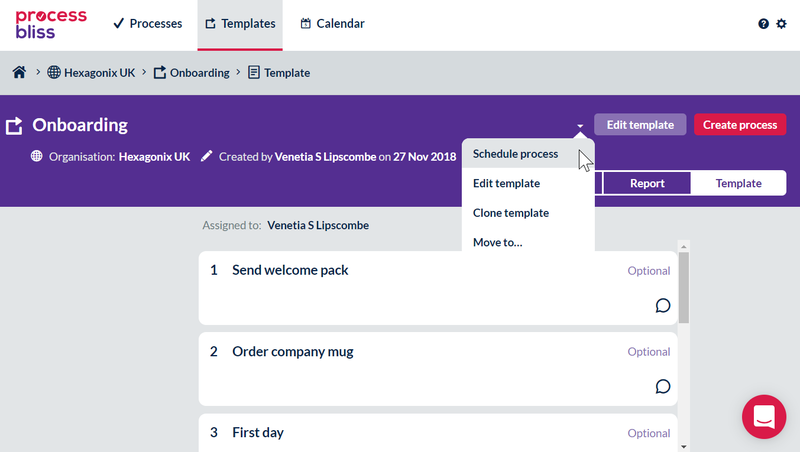 Templates are the easiest way to make sure the repeatable processes in your business are carried out the same way every time. 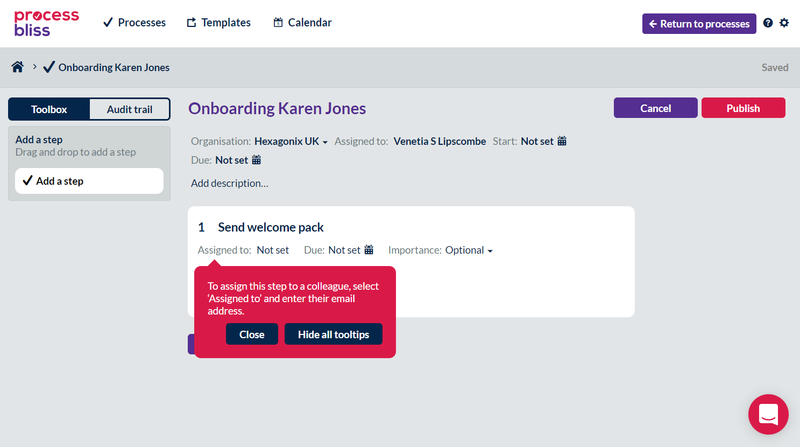 For example, if you’ve created a process for onboarding customers, you’ll want the same steps to be repeated for each new customer that comes onboard. Saving the process as a template ensures this consistent approach. Working this way also means you’ll soon build up a library of templates for the processes that are important in your business. Once you are up-to-speed and happy creating processes and templates on your own, you can disable Tooltips by pressing the 'Hide all tooltips' button on one of the tooltips. If you need reminding at any stage, you can turn Tooltips back on again. Click on the settings button in the top right hand corner of the screen, select the help button at the bottom of the list, and click on ‘Show all tooltips’. You can now schedule processes directly from the Template dashboard. Simply click the white down arrow to the left of the Create process button and select Schedule process. Your non-recurring processes now appear on the calendar as well as recurring ones. 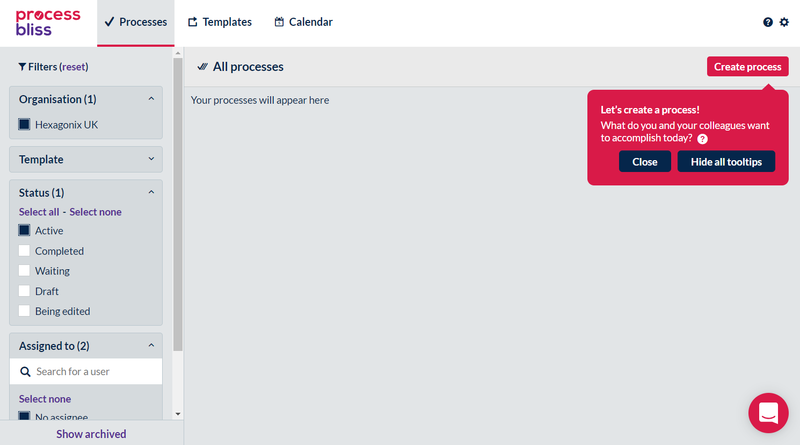 You can now access the support site directly from the Process Bliss dashboard. Simply click the help icon to the left of the settings button. 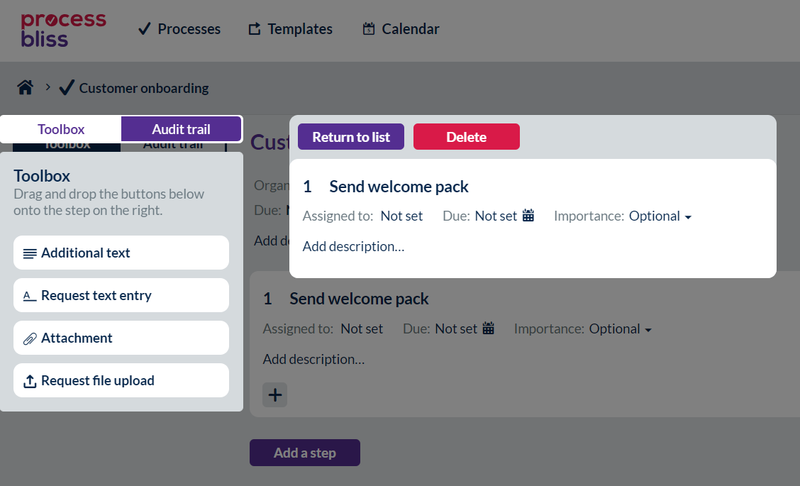 Here’s a sneak peak at some new features and improvements we are introducing early 2019. 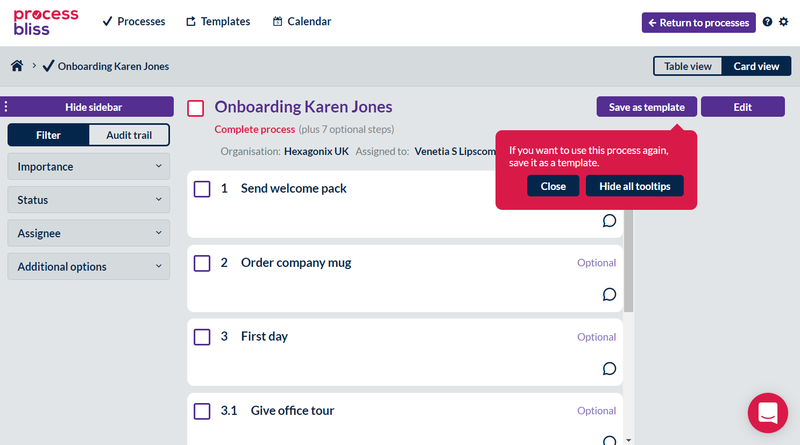 Permissions - allowing you to manage who sees what in your organisation. My Inbox - a new feature to help you prioritise your task list and hide tasks until a certain date.